With just a day left for Diwali, markets in the State capital have come alive. Being Dhanteras festival too, all roads in the city led to jewellery showrooms as customers competed to buy gold. The festival of lights being synonymous with sharing gifts with family and friends, outlets of gifts, sweets and crackers were packed to the brim. Firecracker stores across Hyderabad were a big draw as customers made a beeline for crackers. At the same time, traffic snarls across the city, especially the southern areas of the city, marked the run-up to the festival. With just a few hours left for the festival of lights to set in, the markets bustled with people rushing out to make purchases, throwing the city traffic out of gear. Heavy traffic jams were witnessed in many places across the city, including Begum Bazaar, Afzalgunj, Siddiamber Bazar, Moazamjahi Market, Goshamahal, Puranapul and Madina building stretch. Similar complaints were also received from Gowliguda, Putlibowli, Koti and Abids, Banjara Hills, Chikkadpally, Narayanguda and Koti in the evening. Traffic cops attributed the rush to the huge presence of public on the roads for festival shopping. On a few stretches, the snarls were triggered by road-side vendors who had brought in the ware usually bought for rituals on the festival day. The traffic police had in fact identified a few points where jewellery and sweet shops are located. Personnel were posted at such places to ensure unhindered flow of traffic, but still the huge rush and parking space crunch led to the snarls. The situation is likely to remain the same on Tuesday too with more public expected for last-minute shopping. In view of the forthcoming Diwali, the Telangana State Disaster Response and Fire Services (TSDRFS) is creating awareness to ensure the safety of citizens through a series of programmes across the State. “We are also deploying fire vehicles and manpower in various places to respond immediately to fire-related calls and to ensure a shorter response time,” he said. According to the Fire Department, firemen get many fire calls during Diwali, ranging from small to major mishaps. Last year, a total of 12 mishaps were reported. This year, the department issued licences to 4,258 firecracker shops across the State. While Ranga Reddy division has the highest number of licensed shops with 1,436, Hyderabad has 946 stores. Mahabubnagar has least number of stores with 90. Officials asked citizens to purchase firecrackers only from licensed shops. In case of smoke or fire, they have been requested to call 101 or 9949991101 or the nearest fire station. Burn crackers in narrow lanes. 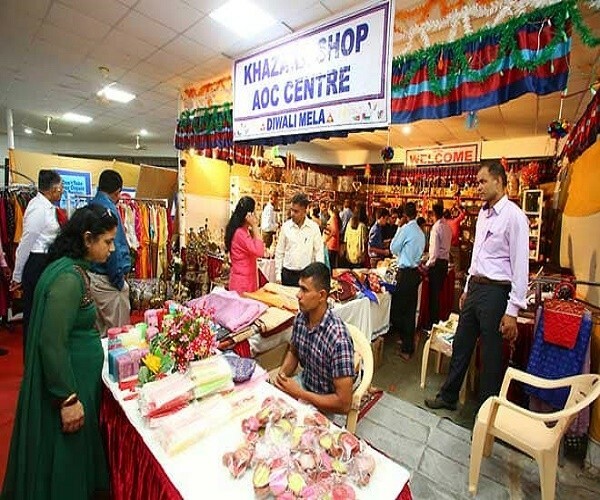 Telangana and Andhra Sub Area for defence personnel and their families residing in Secunderabad Cantonment participated in large numbers in the Diwali Mela celebrations held. The celebrations were graced by senior defence service officers heading military establishments in Hyderabad and Secunderabad.